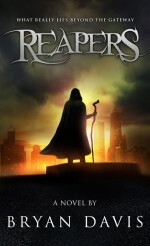 Last week I began posting the sequel to Reapers, tentatively entitled Beyond the Gateway. You can read Part One here. This week, we pick up with Singapore, appearing as a holographic image, speaking to Phoenix and Shanghai. Again, I am using her as an instrument to remind readers of what they need to know from the previous book while at the same time setting up the new story. Since Singapore is uncertain about what Phoenix knows, it’s natural for her to state these facts without making the dialogue feel contrived. The urgent need for action – Phoenix’s goals are set, and the urgency is high. A reminder of a secondary character, Erin, along with a brief description. Romantic tension is reestablished – This story includes romantic elements that increase tension, though potential romantic relationships are not consummated. Such tension is natural, but keeping the characters apart allows the story to progress without entanglement. Also, it is clear that there is no jealousy whatsoever, so the annoying drama often present in romantic triangles is absent here. A new aspect is revealed, a spiritual angle–The Higher Powers and the Sanctae. This adds a big mystery to the entire story world, making readers want to turn the page to learn about it. I pressed a finger to my lips. Hers was a great question, but it could wait. I drew a mental picture of Erin—a trim redhead, around thirty years old. As a Gateway Depot entry clerk, she seemed harmless, but when she started ferrying the souls of innocent execution victims, she became much more sinister. Shanghai sniffed. Her body trembled, but she said nothing. Sing fanned out her cloak, revealing her narrow frame. With the surrounding aura from the hologram, she looked like a dark angel, beautiful and mysterious. “Phoenix, there is a crucial reason for my secretive ways. You are unaware of the Higher Powers. But I can’t blame you for that. Since you were never part of the Resistance, who would tell you? Certainly not Alex. She knows about them, but she would never tell you the truth. “In any case, you cannot understand my real mission without intimate knowledge of the Powers, and there have been no Sanctae in Chicago for months, so you had no opportunity to learn their ways. I certainly couldn’t teach you myself, so I chose to maintain secrecy. If on your path to the Gateway you meet a Sancta, listen carefully. They are often cryptic, but they provide wisdom that is beyond normal understanding.” Sing blew a kiss. “Until we meet again, my dear friend. May the God of the true Gateway guide your steps and show you the love with which I love you.” The hologram faded until it vanished. Wonderfully written as always. Your excerpts are always really intense suspenseful. These three were so wonderfully awkward. Actually, I liked that they could get slightly jealous but still keep in mind that ultimately they were all on the same team (mostly). It was cute, even if I couldn’t figure Sing out for awhile. There was a spark of jealousy, but now that Sing is … well … out of the picture, the jealousy is gone. Right, that’s all I meant.